Last week I saw below image on FB and it made me remember the day when my best Friend had got his first Credit card delivered. We were having lunch when he told about the card and I asked him to lend me the same for a book sale next day. He being generous for me as ways, readily gave me the card and asked me to buy anything I want using that. So next day , I took an auto to the venue only to realize that the venue was shifted a week back and I forgot to check. So again I took an auto and reached the auditorium where the sale was. 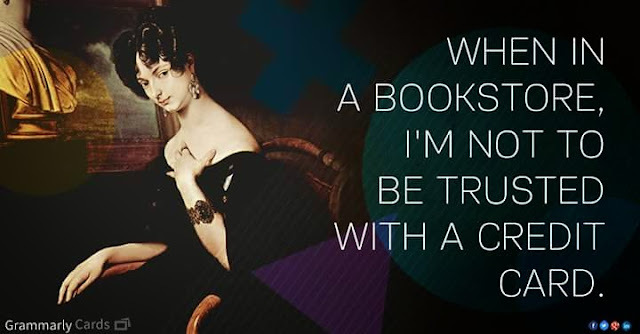 My friend had already ditched me , which was no big deal for me as long as I shopped enough books. 2 hours later , I had spent about 1400 bucks on half a dozen books. Hungry and tired , I left the venue in search for an auto. Now there was a crossing near the venue with 5 roads converging. I am not good with directions and hence , as feared by me , I took the wrong road. There were no streetlights and the bus stand was also deserted much. I had no idea of the whole area so I called up someone to tell me which way to go. Those days , phones did not have maps. One had to login to internet web and then search based on area name which of course I did not know. Finally I walked back 1 km to the sale venue and got a bus to some area that I was familiar with. From there , I took an auto to reach home by 10PM. I do not know what books I bought that day , nor I have those books now ( that story for some other week ) , but I will never forget that sale week. I shouldn't be trusted with a credit card at the bookstore too. Chances are it's likely to hit the maximum limit there! I never told u this ? This is from my bangalore days. The Strand book sale !